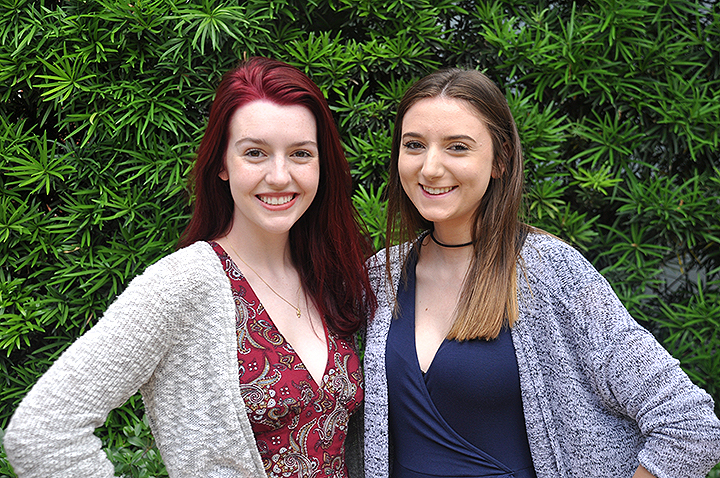 Carley Reid and Miranda Conley are forensic science majors who have had nearly the same schedules since their first year at UT. They are both juniors, who met through the Schools App on Facebook and have been roommates ever since. So it should come as no surprise that when it came to research, the two headed off together this summer to participate in a National Science Foundation Research Experiences for Undergraduates (REU) program hosted by the National High Magnetic Field Lab, which is housed at Florida State University. The students are working with a UT alumna, Amy McKenna ’05, who is a research faculty member at the field lab. 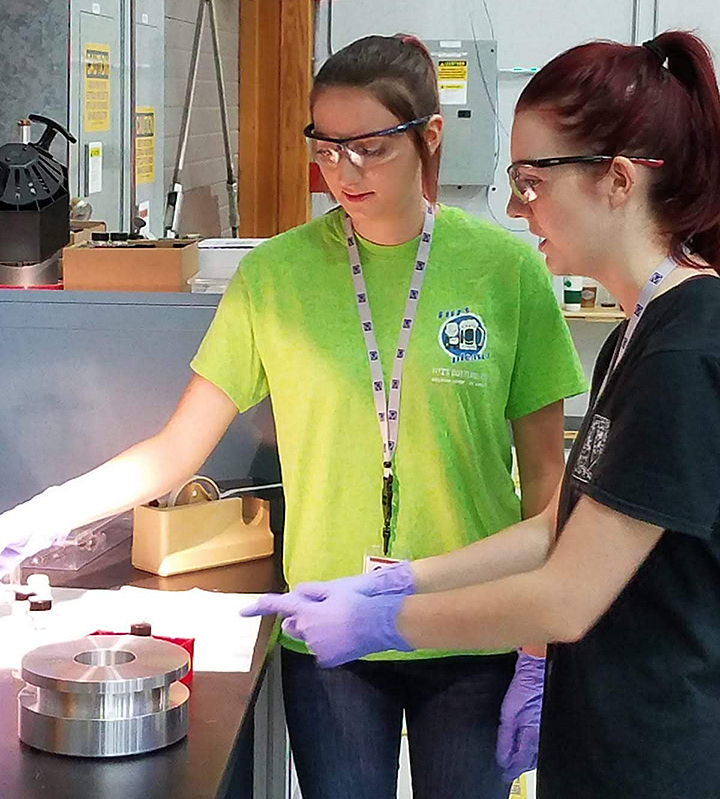 Carley Reid and Miranda Conley are forensic science majors participating in a National Science Foundation Research Experiences for Undergraduates (REU) program hosted by the National High Magnetic Field Lab. While intimidated by the experience, both Reid and Conley said they were excited for the opportunity. The students are studying water quality, or more specifically, the dissolved organic matter (DOM) in compounds in Lake Okeechobee and Tampa Bay. McKenna said both projects will be ongoing to catalogue the molecular signature in these two water bodies over an extended period of time, which is the result of degrading plants and animals. At the end of the summer, Reid and Conley will present their research in a poster session to the entire National High Magnetic Field Laboratory. Reid performs Solid Phase Extraction (SPE) to separate the dissolved organic matter from seawater. 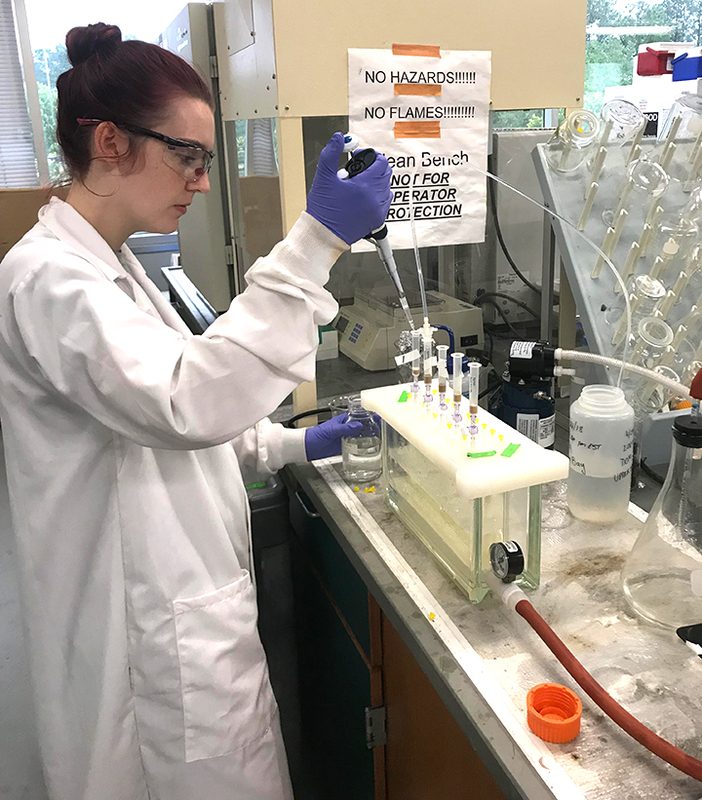 Conley’s work has focused on determining if organic alkalinity has a significant impact on total alkalinity (TA), a measure of water's ability to resist pH changes such as acidification. The relationship with McKenna has been a highlight for Conley, who said she’s been a mentor for them. “Not only is she extremely intelligent, she is also an excellent teacher and coach to us, she is relatable and is funny,” Conley said. McKenna is modeling behavior from her own experiences on UT’s campus. Conley and Reid prepare samples to be run in Negative Electrospray Ionization and Fourier Transformation Ion Cyclotron Resonance Mass Spectrometry (-ESI FT-ICRMS) to gather data on the samples’ composition. Sometimes it just takes jumping in for students to feel more confident. While Conley and Reid were nervous about going into this experience, their tenacity has helped them grow in their pursuit of knowledge. Conley wants a career in drug chemistry or digital forensics, and Reid is considering the field of law enforcement or perhaps becoming a professor.